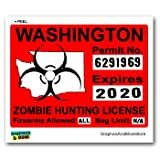 Qty: 1 Decal Size: 4 inches in length x 3 inches in height Image is not of actual scale. Please view the size above for actual size. Please be sure to make certain you purchase a QUALITY VINYL WALL ART DECAL. We Only use TOP QUALITY VINYL that lasts for years. Others are selling lower priced wall art by using lower quality vinyl that will fall off after a few days or weeks! These designs are copyrighted and trademarked by Sakari Graphics. Any products and designs reproduced, distributed, performed, publicly displayed, or made into a derivative work without the permission of Sakari Graphics will be persued for damages as compensation for infringement. This bumper sticker is printed on Weather resistant PVC Bumper Sticker Vinyl with UV resistant ink. Fade free for years. NOTE: We have currently switched to a fade resistant vinyl printer (In Dec. 2011) We will replace any stickers that have faded free of charge purchased prior to December 2011. Please contact us for a replacement if your stickers have faded.